In finance, a credit derivative is a "financial instrument or derivative whose price and value derives from the creditworthiness of the obligations of a third party, which is isolated and traded." Credit default products are the most commonly traded credit derivative product and include unfunded products such as credit default swaps and funded products such as synthetic collateralized debt obligations (synthetic CDOs)(see further discussion below). Credit derivatives in their simplest form are bilateral contracts between a buyer and seller under which the seller sells protection against certain pre-agreed events occurring in relation to a third party (usually a corporate or sovereign) known as a reference entity. These events are called credit events and they relate to the creditworthiness of the reference entity. The reference entity will not (except in certain very limited circumstances) be a party to the credit derivatives contract, and will usually be unaware of the contract's existence. The parties will select which credit events apply to a transaction and these usually consist of one or more of the following: bankruptcy (the risk that the reference entity will become bankrupt); failure to pay (the risk that the reference entity will default on one of its obligations (e.g. a bond or loan)); obligation default (the risk that the reference entity will default on any of its obligations); obligation acceleration (the risk that an obligation of the reference entity will be accelerated e.g. a bond will be declared immediately due and payable following a default); repudiation/moratorium (the risk that the reference entity or a government will declare a moratorium over the reference entity's obligations); and restructuring (the risk that obligations of the reference entity will be restructured). Where credit protection is bought and sold between bilateral counterparties this is known as an unfunded credit derivative. 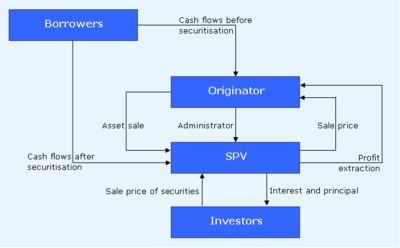 If the credit derivative is entered into by a financial institution or a special purpose vehicle and payments under the credit derivative are funded using securitization techniques, such that a debt obligation is issued by the financial institution or SPV to support these obligations, this is known as a funded credit derivative. This synthetic securitization process has become increasingly popular over the last decade, with the simple versions of these structures being known as synthetic CDOs; credit linked notes; single tranche CDOs, to name but a few. In funded credit derivatives, transactions are often rated by rating agencies, which allows investors to take different slices of credit risk according to their risk appetite. The ISDA reported in April 2007 that total notional amount on outstanding credit derivatives was $35.1 trillion with a gross market value of $948 billion (ISDA's Website). Although the credit derivatives market is a global one, Londons market share rests at about 40 per cent., with the rest value of Europe standing at about 10 per cent. The main market participants are banks, hedge funds, insurance companies, pension funds, and other corporates. The main inter-dealer brokers are Creditex, Tullett-Prebon, GFI Group and ICAP. There are many types of credit derivatives. Credit derivatives are fundamentally divided into two categories of product, funded credit derivatives and unfunded credit derivatives. An unfunded credit derivative is a bilateral contract between two counterparties, where each party is responsible for making its payments under the contract (i.e. payments of premiums and any cash or physical settlement amount) itself without recourse to other assets. In a funded credit derivative, the credit derivative will be embedded into a bond (which will usually either be issued by an SPV or a financial institution), and bondholders will (ultimately) be responsible for the payment of any cash or physical settlement amounts. The credit default swap or CDS has become the cornerstone product of the credit derivatives market. This product represents over thirty percent of the credit derivatives market. A credit default swap, in its simplest form (the unfunded single name credit default swap) is a bilateral contract between a protection buyer and a protection seller. The credit default swap will reference the creditworthiness of a third party called a reference entity: this will usually be a corporate or sovereign. The credit default swap will relate to the specified debt obligations of the reference entity: perhaps its bonds and loans, which fulfil certain pre-agreed characteristics. The protection buyer will pay a periodic fee to the protection seller in return for a contingent payment by the seller upon a credit event affecting the obligations of the reference entity specified in the transaction. The relevant credit events specfied in a transaction will usually be selected from amongst the following: the bankruptcy of the reference entity; its failure to pay in relation to a covered obligation; it defaulting on an obligation or that obligation being accelerated; it agreeing to restructure a covered obligation or a repudiation or moratorium being declared over any covered obligation. If any of these events occur and the protection buyer serves a credit event notice on the protection seller detailing the credit event as well as (usually) providing some publicly available information validating this claim, then the transaction will settle. This means that, in the case of a physically settled transaction, the protection buyer can deliver an amount of the reference entity's defaulted obligations to the protection seller, in return for their full face value (notwithstanding that they are now worth far less). In the case of a cash settled transaction, a relevant obligation of the reference entity will be valued and the protection seller will pay the protection buyer the full face value of the reference obligation less its current value (i.e. compensating the protection buyer for the decline in the obligation's creditworthiness). Credit default swaps have unique characteristics that distinguish them from insurance products and financial guaranties. The protection buyer does not need to own an underlying obligation of the reference entity. The protection buyer does not need to suffer a loss. The protection seller has no recourse to and no right to sue the reference entity for recovery. The product has many variations, including where there is a basket or portfolio of reference entities, although fundamentally, the principles remain the same. A powerful recent variation has been gathering market share of late: credit default swaps which relate to asset-backed securities or Credit Default Swaps on Asset-Backed Securities". A total return swap (also known as Total Rate of Return Swap) is a contract between two counterparties whereby they swap periodic payments for the period of the contract. Typically, one party receives the total return (interest payments plus any capital gains or losses for the payment period) from a specified reference asset, while the other receives a specified fixed or floating cash flow that is not related to the creditworthiness of the reference asset, as with a vanilla Interest rate swap. The payments are based upon the same notional amount. The reference asset may be any asset, index or basket of assets. The TRS is simply a mechanism that allows one party to derive the economic benefit of owning an asset without use of the balance sheet, and which allows the other to effectively "buy protection" against loss in value due to ownership of a credit asset. The essential difference between a total return swap and a credit default swap (qv) is that the credit default swap provides protection against specific credit events. The total return swap protects against the loss of value irrespective of cause, whether default, widening of credit spreads or anything else i.e. it isolates both credit risk and market risk. In this example you can see the coupons from the bank's portfolio of loans is passed to the SPV which uses the cash flow to service the credit linked notes. A credit linked note is a note whose cash flow depends upon an event, which may be a default, change in credit spread, or rating change. The definition of the relevant credit events must be negotiated by the parties to the note. A CLN in effect combines a credit-default swap with a regular note (with coupon, maturity, redemption). Given its note like features, a CLN is an on-balance-sheet asset, in contrast to a CDS. Typically, an investment fund manager will purchase such a note to hedge against possible down grades, or loan defaults. Numerous different types of credit linked notes (CLNs) have been structured and placed in the past few years. Here we are going to provide an overview rather than a detailed account of these instruments. The most basic CLN consists of a bond, issued by a well-rated borrower, packaged with a credit default swap on a less creditworthy risk. For example, a bank may sell some of its exposure to a particular emerging country by issuing a bond linked to that country's default or convertibility risk. From the bank's point of view, this achieves the purpose of reducing its exposure to that risk, as it will not need to reimburse all or part of the note if a credit event occurs. However, from the point of view of investors, the risk profile is different from that of the bonds issued by the country. If the bank runs into difficulty, their investments will suffer even if the country is still performing well. The credit rating is improved by using a proportion of government bonds, which means the CLN investor receives an enhanced coupon. Through the use of a credit default swap, the bank receives some recompense if the reference credit defaults. There are several different types of securitized product, which have a credit dimension. CLN is a generic name related to any bond whose value is linked to the performance of a reference asset, or assets. This link may be through the use of a credit derivative, but does not have to be. Credit-linked notes CLN: Credit-linked note is a generic name related to any bond whose value is linked to the performance of a reference asset, or assets. This link may be through the use of a credit derivative, but does not have to be. Collateralized debt obligation CDO: Generic term for a bond issued against a mixed pool of assets - There also exists CDO-squared (CDO^2) where the underlying assets are CDO tranches. CDO refers either to the pool of assets used to support the CLNs or, confusingly, to the CLNs themselves. Collateralized debt obligations or CDOs are a form of credit derivative offering exposure to a large number of companies in a single instrument. This exposure is sold in slices of varying risk or subordination - each slice is known as a tranche. In a cashflow CDO, the underlying credit risks are bonds or loans held by the issuer. Alternatively in a synthetic CDO, the exposure to each underlying company is a credit default swap. A synthetic CDO is also referred to as CSO. Other more complicated CDOs have been developed where each underlying credit risk is itself a CDO tranche. These CDOs are commonly known as CDOs-squared. Documenting credit default swaps on asset backed securities, Edmund Parker and Jamila Piracci, Mayer Brown, Euromoney Handbooks. PLC magazine, Derivatives Uncovered: swaps, futures and all that jazz, by Edmund Parker. British Banker Association Credit Derivatives Report. PLC Finance Practice Note: Credit Derivatives by Edmund Parker. Documenting credit default swaps on asset backed securities, Edmund Parker and Jamila Piracci, Mayer Brown.